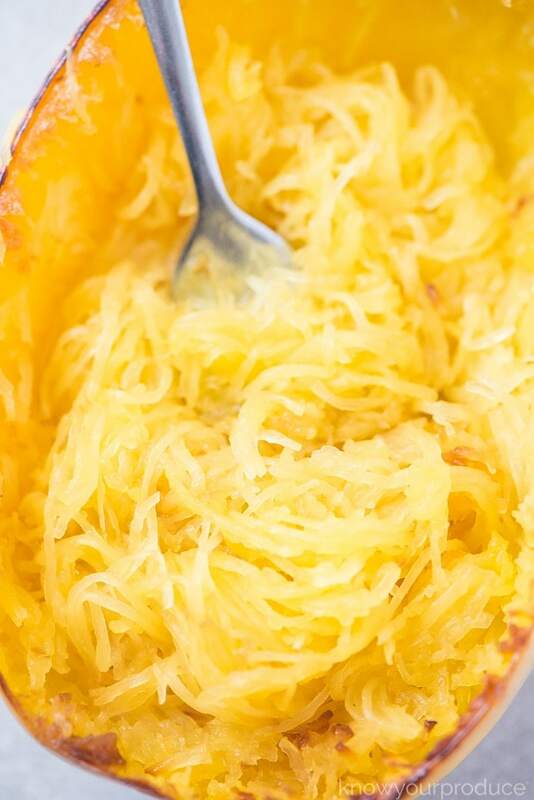 Learn How to Roast Spaghetti Squash to make your favorite spaghetti squash recipes. Not pasta involved, this is strands of squash! Let’s learn how to cook spaghetti squash! 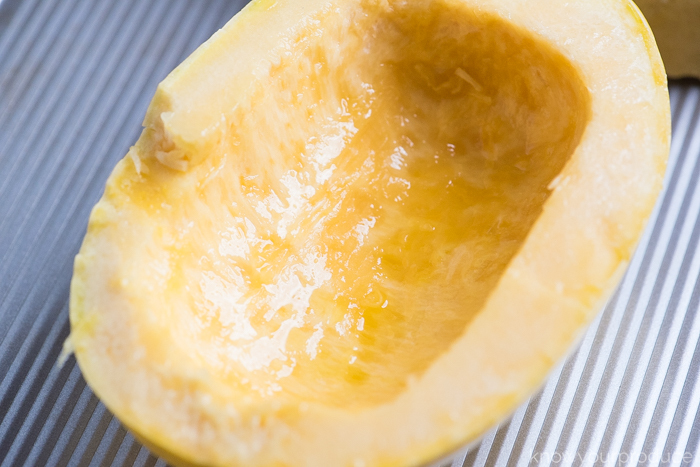 Spaghetti squash isn’t zero carb, but it is lower in carbs than traditional pasta. 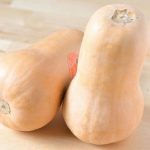 Instead of cooking spaghetti and topping with tomato sauce, try this delicious winter squash. You can easily make it into your favorite pasta recipes. 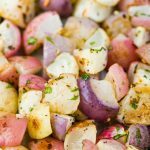 We make spaghetti squash casserole, spaghetti squash boats, and even just a little olive oil, garlic, and salt. We make roasted spaghetti squash. 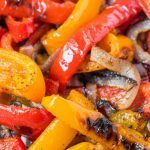 You can also prepare spaghetti squash in the slow cooker or even a pressure cooker. 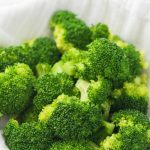 The microwave is our least favorite as microwaving kills off nutrients. 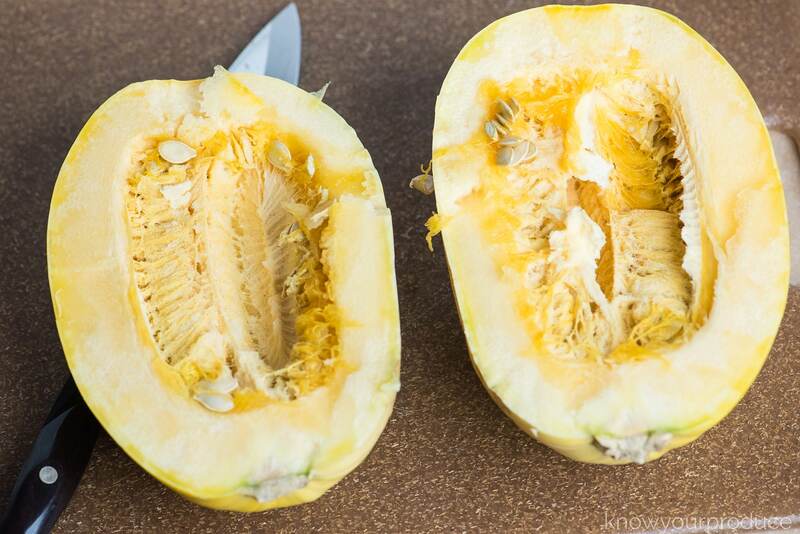 Cut the spaghetti squash in half lengthwise with a sharp chef’s knife. Scoop out the seeds and place them into a bowl. 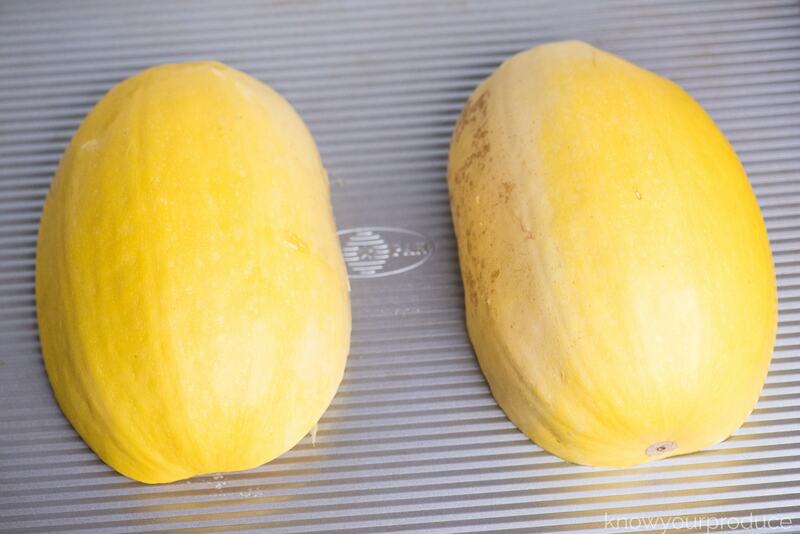 Rub the inside of both squash halves with oil and place cut side down onto a baking sheet. Bake the squash in the oven for 40 minutes or until easily pierced with a fork. Use a fork to fluff the baked spaghetti squash inside. 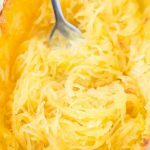 Spaghetti Squash is a low carb option. 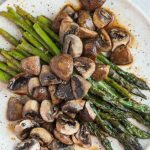 It’s a good source of vitamin A and Vitamin C, Potassium, Calcium, and Fiber. how does it become spaghetti? Once you fluff the cooked squash with your fork you will see spaghetti like strands form. Yes! 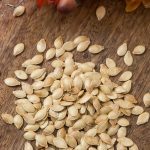 Just like pumpkin seeds, squash seeds are edible. Once you remove the seeds you can clean them and then roast. See our easy recipe for Roasted Spaghetti Squash Seeds. 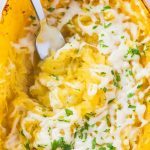 how do you use spaghetti squash? You can use it just as you would spaghetti for the most part. Have a favorite sauce? Mix it with the spaghetti squash. Have a favorite spaghetti casserole? Make the spaghetti squash just like that. 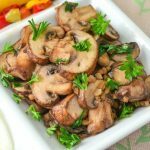 It’s very versatile and will take on flavors nicely. Keep in mind it is squash, so it will have a sweet taste. We love making Spaghetti Squash Boats too! If the squash is too hard to cut you can nuke it in the microwave before cutting in half. This will soften it and make it easier to cut. Try scoring the squash with a knife all around before cutting, just like when carving a pumpkin. Store leftover squash in an airtight container in the fridge for 2-3 days. Use parchment paper on your baking sheet if you don’t want to have a mess, otherwise, we recommend using a good quality baking sheet that is easy to clean. We buy USA pans. 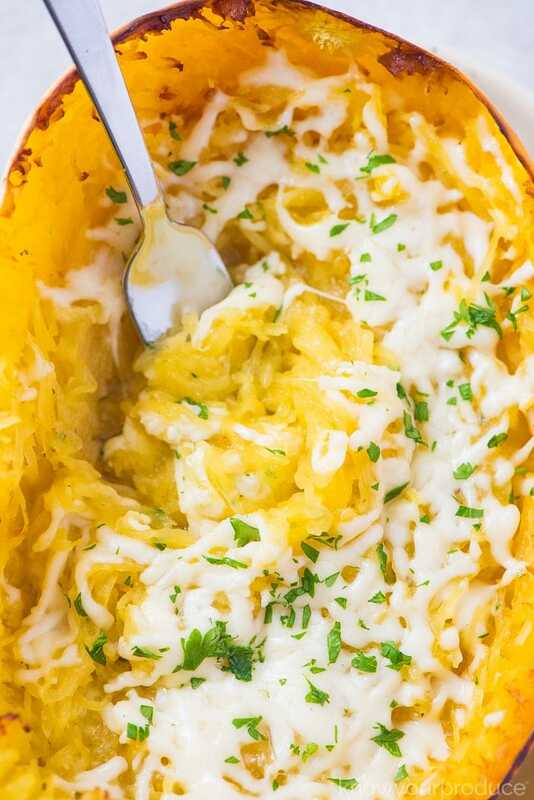 Learn How to Roast Spaghetti Squash to make your favorite spaghetti squash recipes. 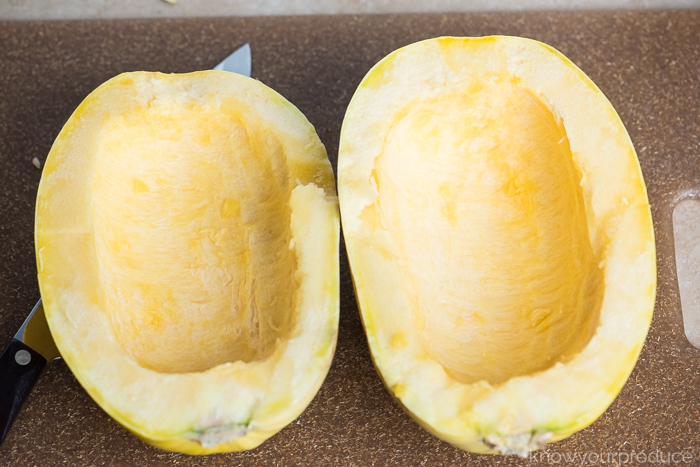 Cut the spaghetti squash in half lengthwise with a sharp knife. Using a spoon, scoop the seeds out and place them into a bowl. Use a fork to fluff the baked spaghetti once baked. recipe tips: If the squash is too hard to cut you can nuke it in the microwave before cutting in half. This will soften it and make it easier to cut. Try scoring the squash with a knife all around before cutting, just like when carving a pumpkin. Store leftover squash in an airtight container in the fridge for 2-3 days. Use parchment paper on your baking sheet if you don't want to have a mess, otherwise, we recommend using a good quality baking sheet that is easy to clean. We buy USA pans. I make my spaghetti squash pretty much the same way.